The aim of this study was to assess the correlation between the level of plasma leptin hormone in diabetic patients with atherosclerotic coronary artery disease (CAD) and the extent of coronary artery lesion using coronary angiography. Leptin is a hormone secreted from adipose tissue and is increased in obese patients in whom there is an increased risk for atherosclerotic coronary disease which can be assessed by means of coronary angiography. A total of 50 diabetic patients with CAD were studied for the assessment of plasma leptin hormone level and its correlation with the extent of CAD by means of angiography. There was a positive correlation between the level of leptin hormone and the extent of CAD. The study suggests that leptin is a significant cardiovascular risk factor for atherosclerotic CAD independent of traditional cardiovascular risk factors. Leptinemia is associated with several biochemical disorders, suggesting that leptin may be a pathogenic factor in cardiovascular disease. The risk for atherosclerotic cardiovascular disease (CVD) in type 2 diabetes mellitus (DM) is two-fold to fold-fold higher than that in nondiabetic individuals . Type 2 DM and CVD are strongly associated with obesity as a risk factor. However, the pathophysiological mechanisms that link obesity and CVD are poorly defined . The clustering of central obesity with insulin resistance, metabolic dyslipidemia, and chronic inflammation may account for a part of the proatherosclerotic effects of obesity . Adipocytes respond to metabolic and inflammatory stimuli by secreting a variety of molecules known as adipokines, including leptin, that are thought to modulate atherosclerosis and are candidate risk factors for CVD . Marked increase in circulating leptin is seen in obesity. However, plasma leptin displays a strong association with cardiovascular risk factors, including insulin resistance, metabolic syndrome, and inflammatory markers, even after controlling for measures of body fat mass . Peripheral actions of leptin that may promote atherosclerosis include endothelial activation and migration , smooth muscle cell proliferation and calcification, and activation of monocytes and adaptive immune response. Leptin receptors are expressed in atherosclerotic lesions, and leptin signaling has been implicated in the promotion of both thrombosis and atherosclerosis in mice models, suggesting a role for leptin in atherothrombosis in vivo . The objective of this study was to assess the correlation between level of plasma leptin hormone in diabetic patients with atherosclerotic coronary artery disease (CAD) and the extent of coronary artery lesion using coronary angiography. An approval from the Research Ethics Committee in Faculty of Medicine was obtained to conduct this work. An informed consent was obtained from all participants. A total of 50 diabetic patients with CAD were studied for the assessment of level of plasma leptin hormone and correlation to the extent of coronary artery lesion by means of angiography. The work was primary carried out at Menoufia university hospitals. This study also included a matched control group composed of 20 healthy volunteers who had a BMI ranging from 25 to 30 and visited the same hospital for routine physical checkups; they gave no history of chest pain or symptoms suggestive of CAD. They also had no evidence of ongoing systemic or cardiac inflammatory diseases. Laboratory investigation including complete blood count (leukocyte counts), fasting blood glucose, renal function tests (blood urea and plasma creatinine), and lipid profile [total cholesterol level, LDL-cholesterol, high-density lipoprotein (HDL) cholesterol, and triglycerides (TG)]. For the assessment of plasma leptin level, blood samples were drawn from all patients and controls after 12 h fasting. The level of leptin was determined in plasma using leptin enzyme-linked immunosorbent assay kits made by DRG International Company (Springfield, Illinois, USA) , which is an enzyme immunoassay based on the sandwich principle for the measurement of leptin in plasma using Stat Fa × 4700, which was made by Awareness Technology Company (Palm, Florida, USA). The sensitivity of this assay was 0.5 ng/ml, and the interassay coefficient of variation was 4.6%. Specimen collection included plasma samples taken from whole blood collected into centrifuge tubes containing anticoagulant and centrifuged immediately after collection. All normal volunteers who visited the same hospital for routine physical checkups were asked to visit our hospital between 8:00 a.m. and 9:00 a.m. after obtaining their informed consent after a 12-h overnight fast and were subjected to full history taking and careful clinical assessment. Height and body weight were measured by trained personnel using standard techniques, and BMI was calculated. ECG data analysis was performed. Blood samples were drawn from the antecubital vein to measure plasma leptin level. All data were inserted in a Microsoft Access database table using the Predictive Analytics Software (PASW Statistics 18, SPSS Inc., Chicago, Illinois, USA). Qualitative data were described using number and percent. Categorical variables were compared using the χ2-test. When more than 20% of the cells have expected count less than 5, correction for χ2 was conducted using Fisher's exact test or Monte Carlo correction. Quantitative data were described using median, minimum and maximum, and mean and SD. The distributions of quantitative variables were tested for normality using the Kolmogorov–Smirnov test and the Shapiro-Wilk test. The D'Agstino test was used if there was a conflict between the two previous tests. If it revealed normal data distribution, parametric tests were applied. If the data were abnormally distributed, nonparametric tests were used. For normally distributed data, comparison between two independent populations was made using the independent t-test, whereas the F-test (analysis of variance) was used for comparison between the groups. P values of less than 0.05 were considered to be statistically significant. Correlations between two quantitative variables were assessed using Pearson coefficient – for example, relationships between log-leptin and BMI. Study groups were compared using analysis of variance. Student's t-test was used to compare continuous variables. Significance test results are quoted as two-tailed probabilities. Significance of the obtained results was judged at the 5% level. Statistically significant at P less than or equal to 0.05 (Monte Carlo test). The mean age was 59.3 ± 9.2 years, and 72% were male. 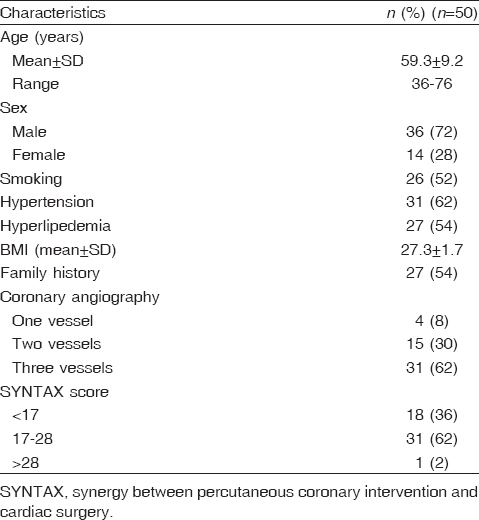 Hypertension was reported in 66.7% of all patients, dyslipidemia in 62%, and smoking in 52% of all patients; 54% of patients had positive family history of CAD and the mean BMI was 27.3 ± 1.7 [Table 1]. 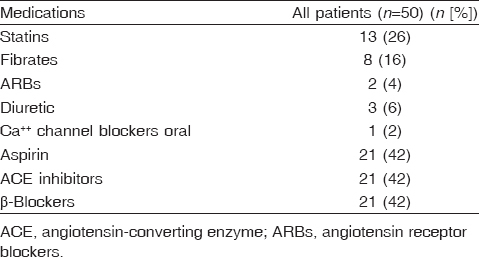 As regards medications, there were 13 (26%) patients who received statins, eight (16%) patients who received fibrates, two (4%) patients who received angiotensin receptor blockers, three (6%) patients who received diuretics, one (2%) patient who received calcium channel blockers oral, 21 (42%) patients who received aspirin, 21 (42%) patients who received angiotensin-converting enzyme inhibitors, and 21 (42%) patients who received β-blockers [Table 2]. 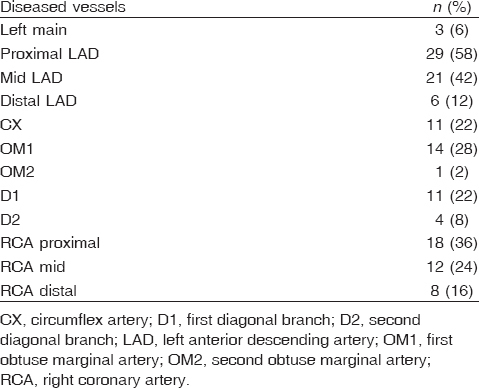 As regards coronary angiographic finding, it was found that 8% of patients had single-vessel disease, 30% of patients had two-vessel disease, and 62% of patients had multivessel disease [Table 3]. 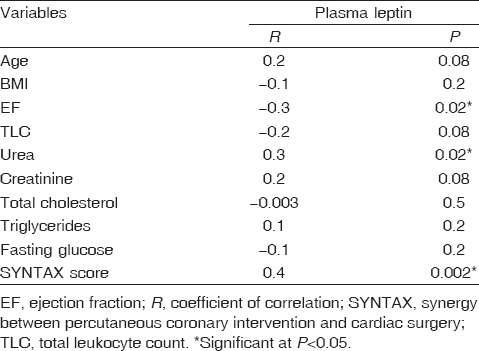 Plasma leptin in the studied patients ranged between 0.4 and 41.52 ng/ml with a mean of 22.7886 ± 13 ng/ml[Table 4]. Plasma leptin in the studied control individuals ranged between 6.6 and 18.8 ng/ml with a mean of 12.7 ± 6.1 ng/ml [Table 4]. Plasma leptin in patients with multivessel disease was significantly higher than that in patients with single-vessel disease and two-vessel disease[Table 5]. There was a positive correlation between plasma leptin level and urea and SYNTAX (synergy between percutaneous coronary intervention and cardiac surgery) score, whereas there was a negative correlation between plasma leptin level and ejection fraction [Table 6]. Our study included 50 patients who presented with a history of CAD who were treated medically for long time. The mean BMI was 27.3 ± 1.7 kg/m 2, the mean age at presentation was 59.3 ± 9.2 years; 72% were male, 62% were hypertensive, 52% were smokers, and 54% were dyslipidemic. Besides being a risk factor for CAD, diabetes influences the presentation and evolution of this pathology. Diabetic patients with CAD are at a high risk for subsequent cardiovascular events. This worse outcome may be partly attributed to other risk factors associated with diabetes, such as hypertension, smoking, dyslipidemia, and obesity, which are common in patients with CAD . The study conducted in Framingham  showed that diabetes doubled the risk for CVD in men and tripled it in women, after adjustment for age. Our results are in agreement with those of Meier-Ewert, who argued that the increased vascular risk for diabetic patients depends little on traditional risk factors. More than half the risk derives from diabetes itself, which leads to vascular inflammation, shown by increases in inflammatory markers such as C-reactive protein and changes in the type and quantity of lipoproteins, with increased TGs and reduced HDL. LDL remains the same in terms of quantity, but becomes smaller and denser and thus more atherogenic, resulting in enhanced platelet activity, elevated procoagulant levels, impaired fibrinolysis, and underlying endothelial dysfunction. In the current study, the mean plasma leptin level (22.79 ± 13 ng/ml) was significantly higher than that in normal controls, and it was positively related to fasting blood glucose level. Our results are in agreement with a study conducted in Poland by Krasnodebski et al. , who studied 58 patients with CAD and detected high plasma leptin levels in diabetic patients. Hypertension is a well-known modifiable risk factor that predisposes to the development of left ventricular hypertrophy, coronary flow abnormalities, and systolic and diastolic dysfunction. This complex of abnormalities is known as hypertensive heart disease and eventually leads to heart failure. Hypertension not only affects the microcirculation but also accelerates atherosclerosis in the larger epicardial vessels. Thus, it is an important risk factor for atherosclerosis by directly producing injury through mechanical stress on endothelial cells . In our study, the second prevalent risk factor observed was hypertension, in 31 (62.0%) patients who were hypertensive and 19 (38.0%) patients who were normotensive. In the current study, plasma leptin level was not correlated to hypertension in which statistical significance was not reached. Our results are in agreement with those in the study by Thomopoulos et al. .
As visceral fat increases, the accompanying insulin resistance results in a decreased ability of tissues to respond to insulin or take up glucose. The resulting lipid profile demonstrates elevated TGs, low HDL, and often normal LDL (although small and dense) and is often referred to as the atherogenic dyslipidemia. Optimal lipid management is essential for vascular disease prevention . In the current study, there was a nonsignificant correlation between plasma leptin level and total cholesterol and TG. This is in agreement with the study that demonstrated that the relationship between leptin concentrations and lipid profile and lipoprotein levels among hyperlipidemic adult patients was not statistically significant . In contrast, another study reported that leptin hormone increased with the increase in cholesterol, HDL, and LDL, except for TG. It can be concluded that leptin production occurs mainly in adipocytes and is highly related to lipid profiles . In the current study, there was a nonsignificant negative correlation between plasma leptin level and BMI. This can be attributed to the small sample size in this study. It may also be attributed to the lack of other data in this study, such as measurement of waist circumference, which may be more important in correlation to leptin. Plasma leptin in the studied patients ranged between 0.4 and 41.52 ng/ml with a mean of 22.7886 ± 13 ng/ml. Our results are in agreement with a study conducted by the British Regional Heart Study in 2007 , which is a large prospective study of CVD that implicates leptin as an independent risk factor for CVD and suggests that it may be an important link in the development of cardiovascular risk with obesity. Plasma leptin was significantly associated with a variety of mechanisms that may link it to vascular diseases, such as insulin resistance syndrome, its components (hyperlipidemia and hypertension), increased levels of inflammatory markers, plasma viscosity, increased coagulation activation, and increased levels of endothelial markers, independently of waist circumference. These factors have been previously shown to be associated with risk for CVD. In this study there was a significant positive correlation between the level of leptin hormone in blood in diabetic patients with atheroscelerotic CAD using coronary angiography. There was a significant positive correlation between SYNTAX score and leptin level in the studied population. Thus, higher SYNTAX scores are indicative of more complex disease. Plasma levels of leptin decreased following interventional aerobic exercise training in high-risk patients, which confirms its pathogenic role in atherosclerotic coronary disease . Plasma leptin in patients with multivessel disease was significantly higher than that in patients with two-vessel disease and single-vessel diseases. This is in agreement with a study in which there was a significant association of leptin levels with incident atherosclerotic coronary heart disease, and raised leptin levels could significantly increase the pathogenic risk for coronary heart disease . At the vascular level, leptin seems to potentiate the secretion of various inflammatory markers (C-reactive protein, tumor necrosis factor, and interleukin 2 and 6), and stimulates the migration and proliferation of smooth muscle cells . In obese conditions, leptin may also increase oxidative stress through multiple mechanisms . In the present study, the incidence of coronary involvement in the proximal left anterior descending artery, mid-left anterior descending artery, and proximal right coronary artery was more common in the study population. This is agreement with the finding of a study in which the incidence of coronary involvement in the left anterior descending artery was 40%, that in the right coronary artery was 32%, and that in the left circumflex artery was 30% . This is in accordance with the data given by a study that showed the left anterior descending artery as the most common site for plaque (47%)  and also a study that showed the left anterior descending artery as the most commonly involved artery (60%), followed by the right coronary artery (50%) and the left circumflex artery (42.5%) . Moreover, there was a significant negative correlation between leptin and ejection fraction in the study population. This is in disagreement with a cross-sectional study that included 41 patients in which there was a positive correlation between leptin and ejection fraction . There was a significant correlation between leptin and urea and a nonsignificant correlation to creatinine. Similar findings were reported by Ahamadi et al. . The study suggests that leptin may be a significant cardiovascular risk factor for atherosclerotic CAD independent of traditional cardiovascular risk factors. Leptinemia is associated with several biochemical disorders, suggesting that leptin may be a pathogenic factor in CVD. Laakso M. Cardiovascular disease in type 2 diabetes from population to man to mechanisms. Diabetes Care 2010; 33:442–449. Iciar MT, Cristina SC, Amparo SG, Francisco JC. Type 2 diabetes and cardiovascular disease. World J Diabetes 2014; 5:444–470. Lakka HM, Laaksonen DE, Lakka TA, Niskanen LK, Kumpusalo E, Tuomilehto J, et al. The metabolic syndrome and total and cardiovascular disease mortality in middle-aged men. JAMA 2002; 288:2709–2716. Rajala MW, Scherer PE. Minireview: the adipocyte – at the crossroads of energy homeostasis, inflammation, and atherosclerosis. Endocrinology 2003; 144:3765–3773. Van Dielen FM, Van't Veer C, Schols AM, Soeters PB, Buurman WA, Greve JW. Increased leptin concentrations correlate with increased concentrations of inflammatory markers in morbidly obese individuals. Int J Obes Relat Metab Disord 2001; 25:1759–1766. Yamagishi SI, Edelstein D, Du XL, Kaneda Y, Guzman M, Brownlee M. Leptin induces mitochondrial superoxide production and monocyte chemoattractant protein-1 expression in aortic endothelial cells by increasing fatty acid oxidation via protein kinase A. J Biol Chem 2001; 276:25096–25100. Bodary PF, Westrick RJ, Wickenheiser KJ, Shen Y, Eitzman DT. Effect of leptin on arterial thrombosis following vascular injury in mice. JAMA 2002; 287:1706–1709. Öhman MK, Wright AP, Wickenheiser KJ. Visceral adipose tissue and atherosclerosis. Curr Vasc Pharmacol2009; 7:169–179. Esteghamati A, Abbasi M, Nakhjavani M. Prevalence of diabetes and other cardiovascular risk factors in an Iranian population with acute coronary syndrome. Cardiovasc Diabetol 2006; 5:15. Duarte R, Castela S, Reis RP. Acute coronary syndrome in a diabetic population –risk factors and clinical and angiographic characteristics. Rev Port Cardiol 2003; 22:1077–1088. Krasnodebski P, Bak MI, Opolski G. Leptin in coronary artery disease and period of convalescence in patients with type 2 diabetes mellitus. Kardiol Pol 2010; 68:648–653. Sawicka K, Szczyrek M, Jastrzębska I. Hypertension – the silent killer. J Pre-Clin Clin Re 2011; 5:43–46. Thomopoulos C, Papadopoulos DP, Papazachou O. Free leptin is associated with masked hypertension in nonobese subjects: a cross-sectional study. Hypertension 2009; 53:965–972. Taylor AM. Cardiometabolic risk management in type 2 diabetes and obesity, Curr Diab Rep 2008; 8:345–352. Haluzik M, Fiedler J, Nedvidkova J, Ceska R. Serum leptin levels in patients with hyperlipidemia. Nutrition 2000; 16:429–433. Taleb MH, Younis SJ, Zabout B, Najim AA, Ahmed AI, El-Bayary ES. Relationship of plasma leptin, BMI, waist circumference and cholesterol level among teenagers in the Gaza Strip. Pharmacol Pharm 2014; 5:789–795. Wannamethee SG, Tchernova J, Whincup P. Plasma leptin: associations with metabolic, inflammatory and haemostatic risk factors for cardiovascular disease. Atherosclerosis 2007; 191:418–426. Akbarpour, M. The effect of aerobic training on plasma adiponectin and leptin levels and inflammatory markers of coronary heart disease in obese men. Middle East J Sci Res 2013; 13:1043–1050. Zeng R, Xu CH, Xu YN, Wang YL, Wang M. Association of leptin levels with pathogenetic risk of coronary heart disease and stroke: a meta-analysis. Arq Bras Endocrinol Metabol 2014; 58:817–823. Li L, Mamputu JC, Wiernsperger N, Renier G. Signaling pathways involved in human vascular smooth muscle cell proliferation and matrix metalloproteinase-2 expression induced by leptin: inhibitory effect of metformin. Diabetes 2005; 54:2227–2234. Dong F, Zhang X, Ren J. Leptin regulates cardiomyocyte contractile function through endothelin-1 receptor-NADPH oxidase pathway. Hypertension 2006; 47:222–229. Dhruva GA, Agravat AH, Sanghvi HK. Atherosclerosis of coronary arteries as predisposing factor in myocardial infarction: an autopsy study. Online J Health Allied Sci 2012; 11:1. Sudha ML, Sundaram S, Purushothaman KR, Kumar PS, Prathiba D. Coronary atherosclerosis in sudden cardiac death. Indian J Pathol Microbiol 2009; 52:486–489. Yazdi SA, Rezaei A, Azari JB, Hejazi A, Shakeri MT, Shahri MK. Prevalence of atherosclerotic plaques in autopsy cases. Iran J Pathol 2009; 4:101–104. Nasri H. Plasma leptin concentration and left ventricular hypertrophy and function in maintenance hemodialysis patients. Minerva Urol Nefrol 2006; 58:189–193. Ahamadi F, Bosorgmehr R, Razeghi E. Relationship between plasma leptin level and laboratory and anthropometric indices of malnutrition in patients on hemodialysis. Indian J Nephrol; 2008; 18:105–111.